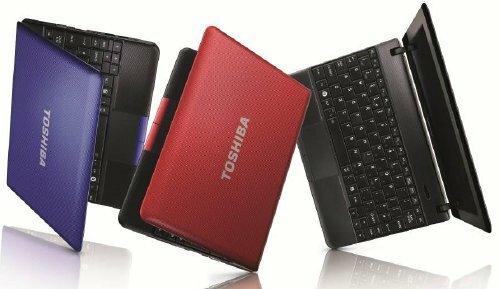 Toshiba introduces the Mini NB510, a new 10.1" netbook with Windows 7 Starter Edition and Intel's Atom N2600 dual-core processor. Additionally, the company also updated its NB520 netbook with Intel's new Atom. Toshiba UK today announces the launch of the Mini NB510, the latest model in the award winning Mini NB500 netbook range. Available in a choice of stylish colours, the Mini NB510 features an all-day battery, high definition connectivity and a compact design – matching convenience with portability. The latest Intel® Atom™ processor and 1GB of DDR3 RAM ensure the Mini NB510 is capable of running multiple programs simultaneously. Powerful dual-core performance allows users to enjoy high definition movies, stream TV shows on-demand and use social networks on the move. Up to 10 hours of battery life makes the Mini NB510 an ideal companion for travellers on long-haul journeys, or using away from power sockets for extended periods of time. The 25.7cm (10.1”) TruBrite® LED backlit screen displays bright, vivid high definition images with clarity and detail, ideal for web browsing, viewing photographs or for enjoying movies. For users that require a larger screen, the Mini NB510 also features an RGB port, while an HDMI® port makes it easy to output high definition content to an external monitor, HDTV or projector, enabling big screen playback. The Mini NB510 is available in a choice of red, blue or black finishes, providing options to suit any style. Toshiba UK today also announces the existing Mini NB520 netbook series has been updated to feature the latest Intel® processors, for improved performance and more efficient power consumption – improving loading times and extending battery life. Like the Mini NB510, the Mini NB520 also features HDMI® connectivity, making it easy to output content to a bigger screen, such as a high definition television, monitor or projector. Available in a stylish brown finish, the Mini NB520 also features speakers designed by audio specialist Harman Kardon® and Dolby® Advanced Audio™ for exceptional portable sound. Additionally, a dedicated Sleep-and-Music USB port lets users play music from an MP3 player through the netbook’s speakers, even when in sleep mode. The Mini NB510 and Mini NB520 will be available from Q2 2012.